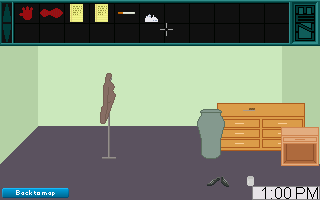 Private Detective is a procedurally generated murder mystery game, where you must solve randomly generated crimes by finding leads, questioning suspects, and gathering evidence from the crime scene to compare with samples found in the homes of the suspects. 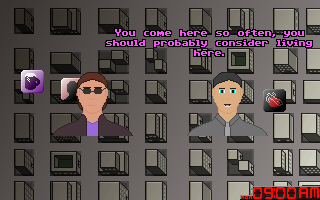 It plays a lot like an adventure game, but with a lot more deduction and a lot less inventory object puzzles. The game has no end goal, except for the completion of as many cases as you can. I’m developing it to be something akin to Minesweeper or Solitaire. A fun little distraction that you play for a short while. As such there's no story (although I'm thinking about adding something extra after a hundred cases). I know the title is really boring, but it's the best I could come up with. And unless I think of something better, it's probably going to stay like that. The game is roughly 94% complete. I would be more specific, but I'm kind of winging it, so I'm not sure how much more I'm going to add. What I can say though is that it’s fully playable, but it’s lacking a few cosmetic things, and it probably has a few bugs. The deadline I’ve set myself is mid-july (which would make the full development cycle for this game around four months). And if I continue at the pace I’m going, and nothing major happens that distracts me from working on the game, I think it’s quite likely I will meet that deadline. Looks cool. Ambitious project, hope all goes well! I must say that it's usually the story that motivates and pushes me forward and I do like having a proper ending in a game, but this sounds like a very interesting concept and I'm curious to see how it ends up. Looking forward to try it out in July. Well hey, there was a game on the C64 called "Detective" so I wouldn't worry too much. It's hard to come up with an original title. My latest project didn't have a name until a few months into making it. Interesting idea, I'm curous how it will come together. Thanks everyone for the words of encouragement. It helps a lot, and I'm really grateful! 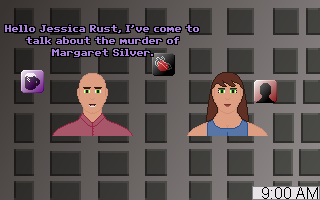 I've fixed a few minor bugs, and added portraits to the conversations you have with suspects. The reason for the portraits, is that I really wanted an excuse to have a character creator screen. Ooo my favourite thing to program, I'd love to hear about what technique you use to go about creating a random yet solvable puzzle. I'm glad it's your favourite thing to program. At this rate, I think it would be quicker and easier to custom make two hundred cases. My technique to make the cases random but solvable, was by first having distinct rules, such as needing to find at least three evidence against the killer, their motive, and make sure they have no alibi. Then when the case is generated, it sets which one is the killer, makes sure that all of those needs are met, and ensures that at least one or more of those needs are not met for the other people. 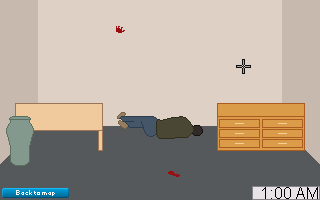 The biggest mistake I made at the start, was hardcoding the game to have four suspects. Four seems like a good minimum, and the game is certainly hard enough, but I'd love to have it vary between four and six. Just finished adding weapons, witnesses (currently only used for verifying the alibis of suspects), a whole bunch of tweaks, and a some more customization options. Now it's time for me to take a nice... long... break. EDIT: And by nice long break, it seems as though I meant one day. 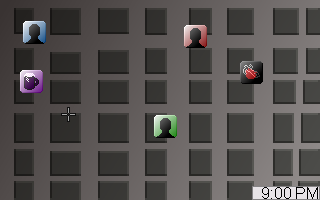 I've finally finished all of the UI elements. Well, all of them except the logo on the main menu. And I guess there's always room for improvement. I haven't updated this thread in over a week. Time to update it again. I've added "Meetup" locations, which are locations where one of your suspects wanted to meet up with someone. You can usually find a few items there, including a stashed weapon. 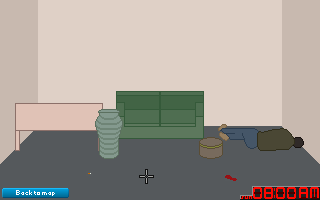 I've also been adding some variance to objects you find in rooms. I'm hoping to add a lot more varieties, and even include some variations for items you pick up. As you can see, I haven't gotten around to adding a possible picture to the wall, or even variations of the wallpaper. But that's next on the agenda. You may notice that something else has been added to the clock though. The game now keeps track of the day of the week, and gives you a timelimit of one week to solve a case. I still need to do some testing to make sure a week is enough, but based on how the game works, a case should take a maximum of five days in the absolute worst case scenario. Still, testing is important. Are you aware of this module? Well that would've been very useful to have before I began. Unfortunately, it would probably be more effort to start using seeded random numbers at this point. But thanks for pointing me towards that module. 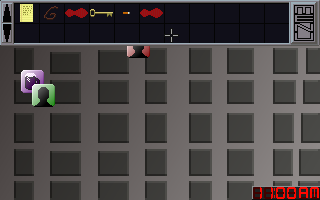 I've added more variety to rooms by making the wallpaper and carpet randomly change. I've also added the possibility of pictures appearing on the wall. I'm currently using scaled-down colour-decreased versions of the sample pictures that comes with Windows 7. They fit surprisingly well, and I'm even considering keeping them in there. But maybe I might take a few photos just to make sure everything in this game is 100% mine. Some feedback on this would be appreciated. 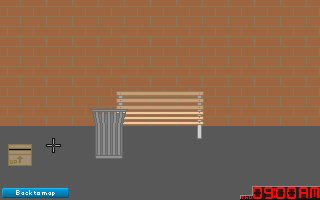 I've also changed the city background, making it look much better. You can also get a game over if you falsely accuse someone three times in a row. In other words, if you end up with three unsolved cases in a row. But the most recent change has been the addition of cutscenes. After 10, 25, 50, 75, and 100 cases, you'll get a small cutscene with the bartender. This eventually culminates in an ending of sorts. I don't expect anyone to try and complete 100 cases just to see that ending, I just added it so anyone enjoying the game, has an excuse to keep playing the game. There are also two endings, one if you solve every single case with no unsolved cases, and one if you get at least one unsolved case. The "good" ending is quite lackluster, but I had to include it, because the "bad" ending wouldn't make any sense if you solved every single case without problem. Loved the clock on the right for timing and the dead guy! I am curious for the cutscenes! I want to try to play with someone by my side so we can discuss on the cases. That is going to be a huge help in my current project! Cheers! That module is very fun, combine it with the drawing functions you can easily create an infinite desert or something, all in one AGS room. I would advise that you never have the seed set to 0, you get weird results. I'd go into more detail but don't want to derail the topic. The game is now FINISHED! Find the completed game thread here. Feel free to close down this thread. Damn, is it stressful to release a game. I'm just glad it's over. Here's hoping nothing went wrong. Stressful but quite an accomplishment! Congrats on the release and good luck!